I ordered 40 pound of nectarines from Azure Standard this month. When I ordered them it didn’t sound like very much (I actually thought of ordering 60 pounds) but when I got them and they were staring at me from their good sized boxes 40 pounds was more than enough. 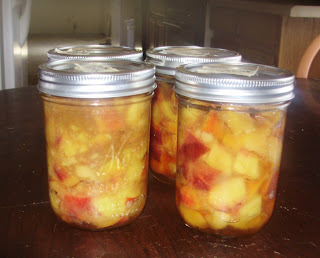 I have only canned conventionally one time when a friend gave me a lesson on peaches last year. It was a full day but seemed quite manageable so I thought I would have no trouble with canning. hmmm. My original plan was to ‘can’ one box and do a combination of fermenting and freezing for the second box. My plans changed. Here’s the end result of my conventional canning. It took me pretty much all day and I ended up with 4 pints of Spicy Nectarine Butter (recipe in Ball canning book) and a house that was about 400 degrees. The freezer became my friend that day. I now have about 16 quarts of nectarines in the freezer. When I was more ambitious I removed the peels on them and laid some out on cookie sheets to freeze so they will be good for smoothies. By the end, I was lucky to get the pits out of them and cut in half. I also pureed some and put in small little 4 ounce containers to freeze for future yogurt flavoring. I did manage to put up a few ferments. I love doing ferments and have done quite a few in the past most with good results. I can do a jar or two at a time and it does not heat up the house. The only drawback to ferments is needing to keep them in cold storage. We do not have a cellar which would be wonderful for storing ferments. We do currently have a second fridge that my sister has loaned us so that is usually where my ferments end up (along with extra eggs and milk and anything that I don’t want the kids to snack on). I did two jars of Nectarine Chutney. I adapted the recipe for Fruit Chutney in Nourishing Traditions to satisfy the ingredients I had on hand. Here are four jars of what I hope will become Nectarine Syrup. As a guide, I used the recipe for Raspberry Syrup in Nourishing Traditions. I did two of the jars ‘plain’ and two spiced. I just put these together yesterday so they need to sit at room temperature until tomorrow. I did ‘burp’ the jars a bit ago (to keep them from exploding) and they looked very nice and smelled wonderful. I saved the peels from the nectarines that I removed and plan to make Nectarine Honey. But my plan is just to make the ‘juice’ part now and freeze it and then when the temps are lower and I want the house heated up I’ll do the water bath canning part. Mix water, lemon juice, rind, sucanant and whey. Cut fruit and add lemon juice mixture to it. Mix with raisins, herbs and spices. Place in a quart jar (or two pint jars) and press down lightly with a wooden mallet. Add more water if necessary to cover the fruit. Make sure the mixture is at least one inch below the top of the jar. Cover tightly and keep at room temperature for two days before moving to cold storage. Place nectarine pieces in a quart jar (or divide into two pint jars) and press down lightly with a wooden mallet. Mix salt, sucanat and whey and pour over jar (or divide by two jars). Add filtered water to bring liquid to the top of the fruit. Leave at least one inch from top of fruit to top of jar. Cover tightly and keep at room temperature for two days before moving to cold storage. Add 1 teaspoon cinnamon, 1/2 teaspoon nutmeg and 1/2 teaspoon ground ginger to the salt, sucanat and whey mixture. What have you been preserving? Be sure to visit GNOWFGLINS for a Nourishing Jams, Jellies, Preserves and More Blog Hop. >400 degrees! I believe it! You poor thing. 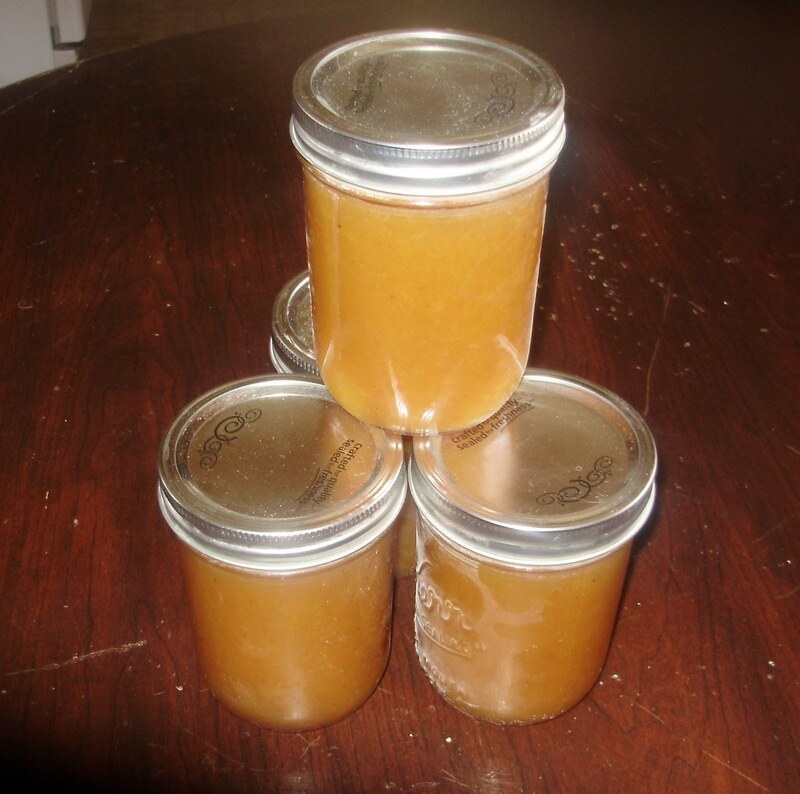 Thanks for sharing what you've done with peaches in the jam blog hop. Great post, Millie! >Okay, I am sorry I said peaches instead of nectarines. I always mix those 2 up. 😉 Oops! >Thanks Wardeh. Funny thing is I keep calling them peaches too. 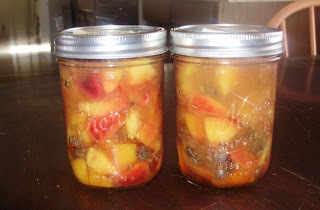 I even labled the pics as peach jam, peach chutney, and peach syrup. doh. >I bought a small bushel of peaches back in june and it took me FOR.EV.ER to pit and peel those things. I just put them in the freezer because I was trying to can a bushel (15lbs) of tomatoes at the same time! Yeah. I hear ya on that forever thing. Whew. Are yours still in the freezer or have you done something else with them? I moved my ferments to cold storage today. I think they turned out lovely. >Next time you try any sort of fruit butter, don't work so hard! 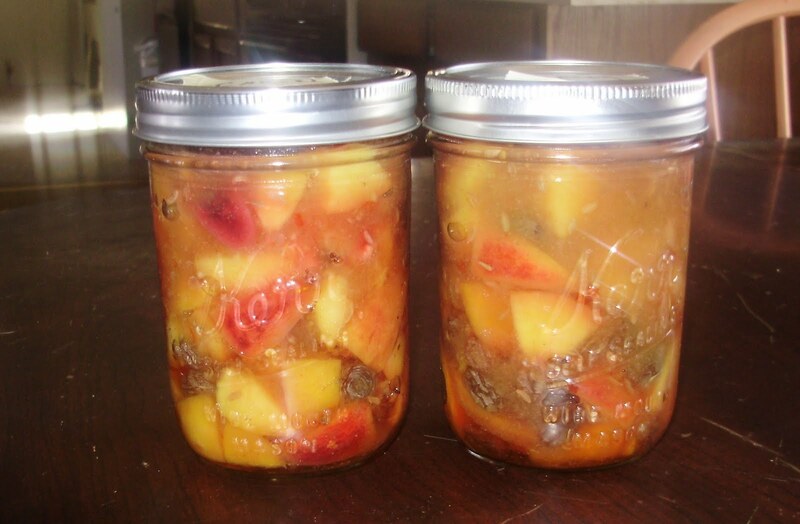 The one true way to do fruit butters is in the crock pot! Put the ingredients in, put it on high, leave the lid slightly cockeyed, so moisture can escape, and give it a stir once in awhile. I put it on low & put the cover on properly overnight, just 'cause leaving it the other way while I'm asleep makes me nervous. When your butter is done, jar it up & process the jars. You are so right. About half way through the boiling process I thought about my crock pot. I've done apple butter that way before and froze it. Next time I will for sure use the crock pot. No problem to use the photo. I love what you all are doing!